Artistic Pursuits is a class my daughter is really enjoying! She loves to draw, doodle and write, so anytime she gets to do it for school, she is super happy! I am also going to start my son on this program later. 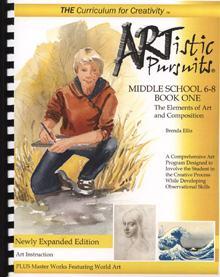 We received the Artistic Pursuits Middle School 6-8 Book One, The Elements of Art and Composition. The book is $47.95 and is suggested for ages 11 and up. Students explore their world in an engaging study designed to strengthen observation skills. In the art appreciation and history lesson, students learn how each element is used in a Master artwork. They gain insight about the artist, how the goals of a culture affect the look of the artwork, and discover contrasts between Eastern and Western art. Instruction in graded pencil drawing and ink utilizes the knowledge gained through the study of art from countries around the world including Japan, China, Europe, India, Australia and more. Technique and application pages allow skills to develop naturally as students work independently. Four special assignments show how artists combine elements of art and broaden the student’s experiences with art materials. The book provides lessons for the completion of sixty-eight finished drawings in pencil and ink that are both original and entirely the student’s own. We purchased a Sketchbook for my daughter, so that all her work is kept in one convenient spot. She is able to work through the book with very little assistance because of the way the material is written. Each lesson is written in a conversational tone. All assignments are described very clearly, so she seldom has to ask for help. She also likes the little Creative Cory cartoons that are throughout the book. By working twice a week she is able to practice some of what she is learning during the week and it gives her time to absorb what she is learning. I am concerned if we did more than this she would breeze through and not take time to actually learn the techniques or objective being taught. Some of the topics covered include:space, line, shape, form, textures, balance, symmetry, perspective and much more. Below is one of her first drawings. Maybe after she is finished we can post another and see how she has improved. You can see how much detail goes into the lessons. I have to say I really believe Artistic Pursuits is well worth the cost of the book. You can use this book over and over again for other children and I really think your child can learn quite a bit from this series. Please take a minute to see what other Crew members had to say about Artistic Pursuits. They reviewed many different age levels, so if your child is not in this age level, check out one of the reviews that is for their age level.